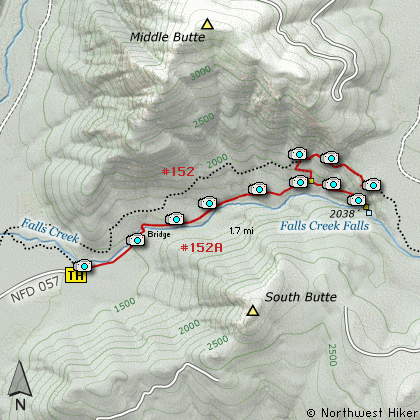 This excellent little hike begins off Forest Road #057. The trail is gentle and well used. You will climb a bit at first and then in about a half mile you will come to a unique suspension bridge that spans Falls Creek. After crossing the creek, the trail parallels the creek all the way to the base of the lower falls. There will be times you can see the creek as you hike along, but most of the time you are high enough above it that you can only hear it. 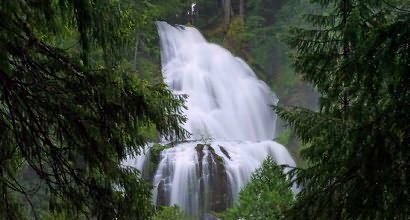 As you near the end of the trail you will break out onto a rocky cliff area where you get great glimpses of the upper falls. When you reach the end of the trail you will be at the base of Falls Creek Falls. You can see the upper falls, but not nearly as well as the lower falls right in front of you. Note that from December first to April first the gate allowing access to the trailhead is closed. Turn right continue north on FR30 for another 0.8 miles and you will come to Forest Road 3062 on your right. Turn onto FR3062 and follow it another 2.4 miles until you come to a spur off this road on your right numbered FR057. Turn right onto this spur and follow it a short distance to the parking area and trailhead for this hike.